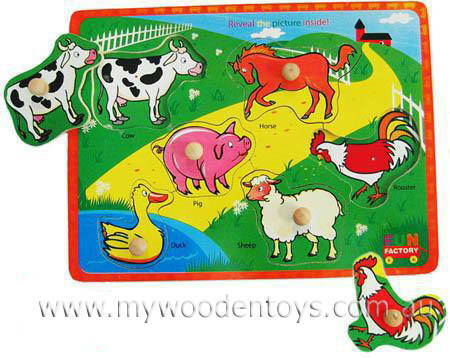 Knob Puzzle Farm Animals is a great puzzle filled with happy farm animals. This colourful wooden puzzle contains 6 shapes with knobs to make them easy for those little fingers to grasp. Your little one will have fun recognising a Cow, Horse, Rooster, Sheep, Pig and Duck and naming these lovely animals and fitting them into the colourful base board. We like this because: "it's fun learning all the names and discovering the picture under each piece."